Catholics have mass to show adoration to the Savior. They teach Jesus offered Mass at the Last Supper and that the bread and wine offered during mass are literally transformed into the Savior’s blood and body. Mormons have a similar celebration, called the Sacrament. It is offered during a weekly Sacrament Meeting, which is the primary worship service. There are differences between the Catholic and Mormon service, however. Mormons use bread and water in the Sacrament. Although wine was used when Christ held the first Sacrament, Mormons teach that the bread and water only represent the blood and body of the Savior, rather than being transformed into the actual blood and body, and therefore, it is not important that water is used instead. 2 For, behold, I say unto you, that it mattereth not what ye shall eat or what ye shall drink when ye partake of the sacrament, if it so be that ye do it with an eye single to my glory-remembering unto the Father my body which was laid down for you, and my blood which was shed for the remission of your sins. Mormons do not drink alcohol. They follow a health code that prohibits it. In addition, water is easily obtained and requires no special purchase. Because Mormons consider the sacrament to be in remembrance of the Savior, they are focused on the meaning, rather than the specific items taken. However, the Sacrament does follow a carefully prescribed format and has one of the few specific prayers used in the church. In most cases, Mormon prayers are personalized by the giver, but the Sacrament prayers must be given exactly. The Sacrament is prepared by priesthood holders. Boys who are at least sixteen may serve as priests, which is not the same as a priest in the Catholic Church. It is merely one office in the priesthood. The priests tear the bread into small pieces and then bless it (say a prayer.) They give the trays to the deacons, who go out among the congregation, distributing it. Boys ages twelve and thirteen may serve as deacons. 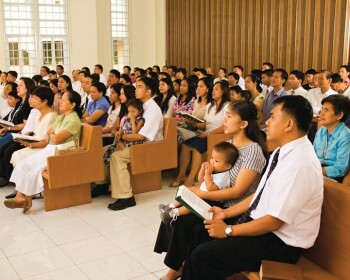 The congregation remains seated throughout the Sacrament. The bread is broken into small pieces by two priests, representing the way Christ’s body was broken on the cross. The water represents the blood that was shed for us. It is placed in small disposable cups and is prayed over by the second priest. The prayers are given to us in modern revelation, and outlines both the purpose of the Sacrament and how the church members are to approach it. Note that the prayers were outlined prior to the change from wine to water. Mormons are taught to prepare carefully for the Sacrament. During the week, they evaluate their lives and repent of any sins they may have committed. They try to arrive at the meeting feeling spiritual. As the bread and water are being passed, the room is silent (except for babies and small children) and members are encouraged to read scriptures or think about the Savior, Jesus Christ. It’s a time to reflect on Him and on the wonders of the Atonement in our lives. Although Mormons and Catholics might approach the Sacrament a bit differently, the purpose is the same: To show love and honor to the Savior.